Besides the string lengths being opposite, also notice the reverse bridge pickup angle. But it's still a righty body, so righty players maintain the cutaway. 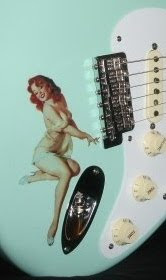 The listing page has full details on Fender's Voodoo Strat series, including source reference url at Stratcollector.com. Go there for the full scoop on Voodoo Stratocasters. I've always wondered why the bridge pup isn't angled this way on all Strats. Think about it-- the bottom will be tighter and the high strings will warm up, although in the case of the reverse headstock there would be some offset to this. But with a conventional headstock the shorter low strings and reverse pickup angle tone difference should be more significant. MetalShopMusic stocks loaded reverse style pickguards for righty Strats. They call them "Gypsy Pickguards". If your body isn't routed for HB in the bridge, you'll need to do some routing so that the reverse angle bridge single will fit.